Modgam 1 Year Blog-o-versary International Giveaway!!!! 1.4k worth of prizes to be won! 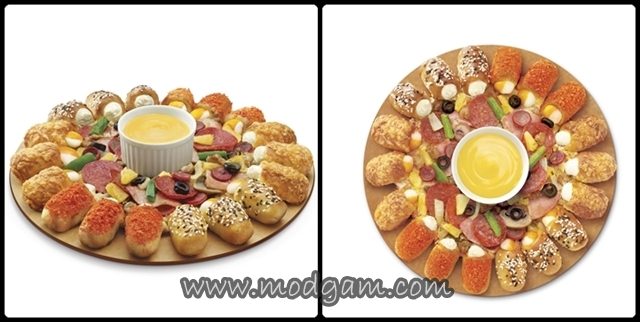 Modgam celebrates 1 year blog-o-versary with a BIG international giveaway! Are you excited??? Over S$1.4k worth of prizes to be won! And because I REALLY want to THANK all my readers (YOU) for all the love and support throughout the year, I am going to try to let everyone win something they like! In order to do that, I will be letting you choose not 1 but top 3 items you would like to win most!! We have so many exciting prizes for grabs for each category; Fashion, Food, Fun-finds and Beauty! Big thanks to the generous sponsors for all the amazing prizes! There are 10 regular Pizza Hut Cheesy Bites Trio pizza to be won! Choose from any of your favorite toppings from Hawaiian to Turkey Bacon & Shrooms and more! Among the 3 cheesy bites, my favourite has to be the black & white sesame! LIKE Pizza Hut FB here! 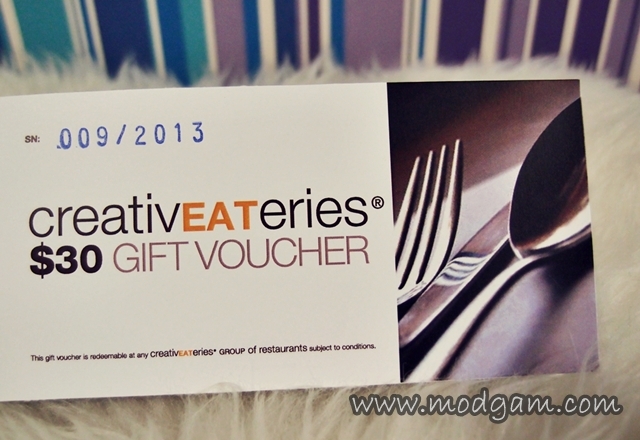 There are 10 Creative Eateries Food Vouchers to be won! With over 9 restaurants ROCKU Yakiniku, Sho Teppan, Suki-ya, Bangkok Jam, Barossa Bar, Boston Seafood Shack, Fremantle Seafood Market, eat at taipei, Xiao La Jiao Sichuan Cuisine to dine in! Wide variety from BBQ, sukiyaki steamboat, Thai cuisine, Seafood and more! I can’t wait to dine at the rest of the Creative Eateries! You are gona thank me for this! LIKE Creative Eateries FB here! 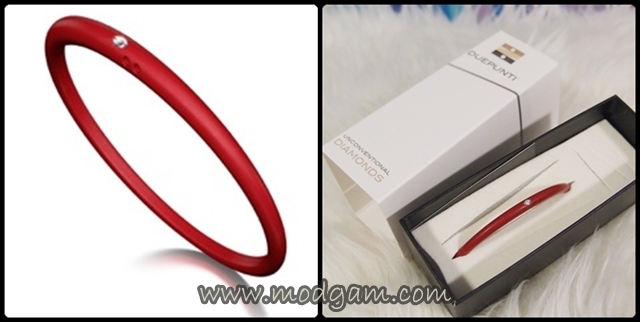 Duepunti’s vibrantly colored silicone band holds a first rate 0.02 carat brilliant cut conflict-free diamond in a sterling 800 silver setting. The non-allergenic silicone is suitable for everyone. A decidedly fresh twist on the conventional bangle! Stack for additional playfulness for there are so many colors to choose from! I fell in love with this fun architectural pouch I bought while holidaying in Taiwan! They reminded me of Issey Miyake Bilbao and you know how much I love my Bilbao’s! 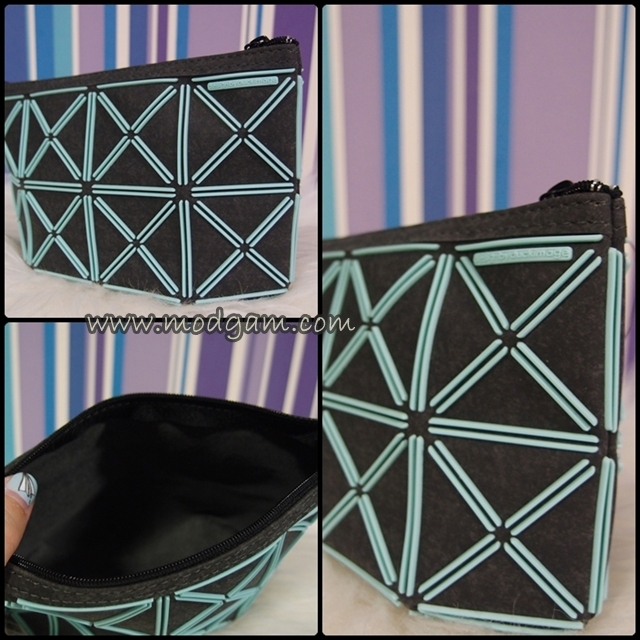 This pouch is light and spacious enough for a coin purse, tissues, mobile, lipstick, keys and maybe a card holder. Absolutely fun! There are 3 Seven Wonders Moroccan Argan Oil Skin Serum to be won! the superior moisturization and hydration of Moroccan Argan Oil. Moroccan Argan Oil is non-greasy and perfect for all skin types. Stay Younger Looking, smooths wrinkles and revives complexion while moisturising and brightening the skin tone! 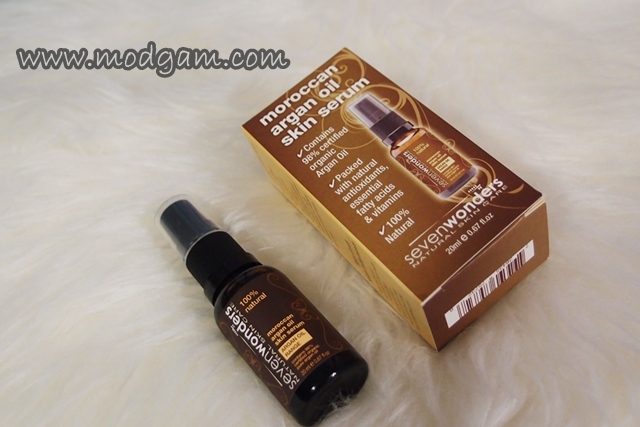 LIKE Seven Wonders Moroccan Argan Oil Skin Serum FB here! 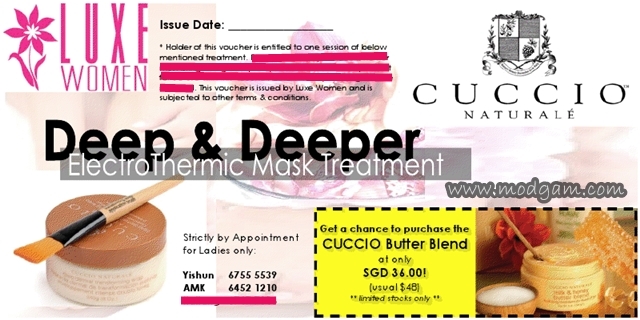 There are 5 Dermal Mask Treatment vouchers to be won! Enjoy a pampering mask treatment for either your hands or feet. An additional ElectroThermic soothing heat therapy treatment will be done to better allow the mask product to penetrate deep into the dermal skin layers while promoting better blood circulation & relieving aching joints/muscles. Fran is an animal lover and with the tip of his pen, he can magically turn lines and dots into life! 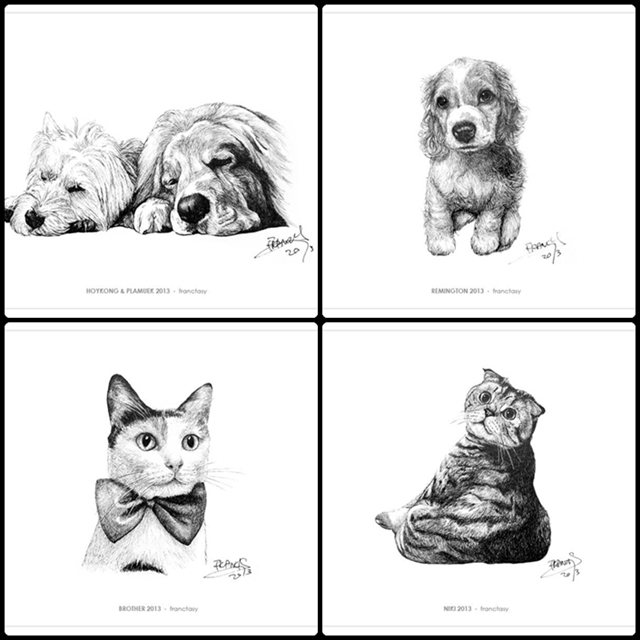 You can now win one of his amazing artwork of your favorite pet! This is perfect for gifting or for remembrance of a pet that is no longer with you. I am loving the banner he drew for me! 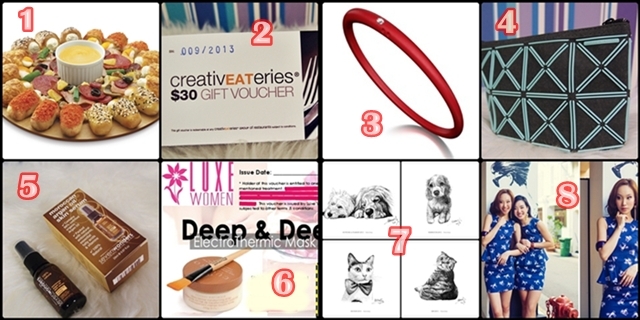 There are 10 shopping vouchers to be won! Their items are handpicked with love from around the world, keeping style and updating fashion trend, bringing the best for you! With the wide assortment of weekly new arrivals, I am sure you will find something you like there! I love their fashionable bags and stylish accessories! (a) FB: Name, email, item you would like to win 1st, 2nd and 3rd choice. (b) Modgam.com: Tell me the name you used for your FB account, email, item you would like to win 1st, 2nd and 3rd choice. Winners will be selected randomly via random.org from the collated comments on 5th May 2013. So the closing date is midnight, 4th May 2013. Any comments made after will not be eligible. The winner will be announced on the blog and contacted via Email on 7th May 2013. GOOD LUCK EVERYONE and share away! Venice Jacob, venicejakecurb@live.com. 4, 1, 5 🙂 Happy blogoversary! Congratulations, Mag & Modgam’s Playground!!! WHEEEE!!! HAPPY 1ST ANNIVERSARY <3!!!! Thanks so much love! Very very sweet of you! U are also still as chirpy n cheery!! I am happy to c all you familiar faces here even after a year. Means so much to me… Remember to take good care of your health, drink more water n take a breather from time to time. Hahahaahahaaaaaa ya, esp the hair color and style. I think i’ve changed quite a bit. Can u believe its been a year???? i4D LIKE TO ENTER but I’d rather not publish my complete name…..
You’re too sweat and so original. I love it. Congrats girl!!! Very cool prizes… Love the Architect unisex blue pouch… too cute! WOWIE what an extravaganza of a giveaway – well done! This is fantastic with some mega awesome prizes! I can tell this is going to be popular! I’m not on facebook so I can’t enter but just to let you know FB don’t allow ‘Like and Share’ competitions and they actually ban member accounts (both personal and business) for hosting and taking part in them. Competitions on FB are done through one of their apps, which you can look for or ask them about I guess since I’ve never done one but just thought I’d give you the heads up. I wouldn’t want this to get cut off midway, especially when it’s so awesome! hey dd, thanks for sharing! I remembered seeing your comment in my notification but i cannot seem to find it till i searched the spam inbox. i wonder how it got there! yes, i am so happy there are a lot of participants. wheeeeee thanks so much for always being so sweet DD! i appreciate it truly! And hey, would you like to try the seven wonders serum oil? i have an extra bottle i would love to send you! =D let me know ok? Yep the giveaway is looking awesome! Well done! Happy 1 year of blogging! The blog is looking fab! Congrats on your one year of Blogging and more beautiful years to come! Hi it’s my first time here! Happy 1 year blog-o-versary & more to come Congrats!!! Thanks Mag, and happy 1st Anni! I would like to win items for 1st, 2nd and 3rd choice: 3, 8, 5!! Sita Madu Wynn, sita4u2@gmail.com, 3,4,5. Awesome Prizes 🙂 Happy Anniversary !! Would love these freebies so that I can celebrate the joy with my mummy for mother’s day. I believe she would be very happy ! !